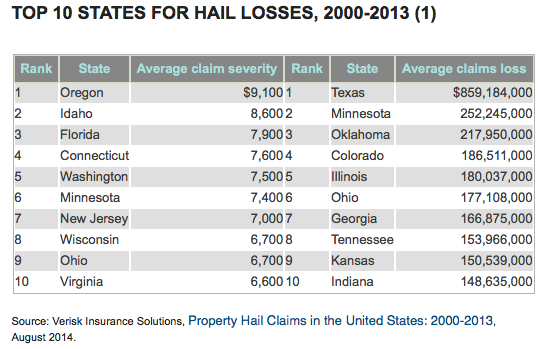 Hailstorms have grown more destructive in recent years, causing up to $10 billion per year in damage. The reasons range from larger homes being built, to more homes being built in vulnerable places, to the rising costs of roofing materials, according to a recent Washington Post article. 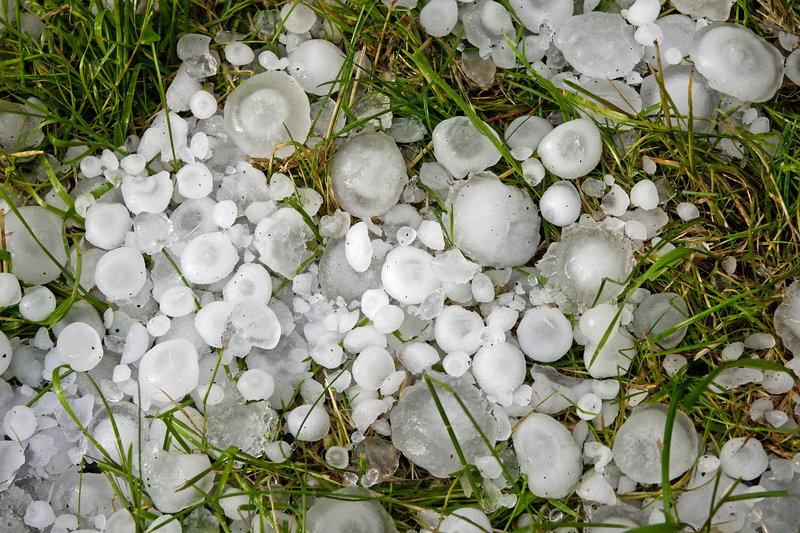 The first North American Workshop on Hail and Hailstorms is happening this week (August 14- 16) in Boulder, Colorado. The group will discuss the rising costs of hail damage, and 200 experts from the fields of meteorology, engineering, economics and insurance are attending. These experts will work together to better detect hail; the microphysics and dynamics of hailstorms; the cost of damage and how to mitigate it; and the likely effects of a changing climate on hailstorms. The I.I.I. has facts and statistics on hail damage here. Severe weather across the United States in May resulted in combined public and private insured losses of at least $3 billion. Aon Benfield’s latest Global Catastrophe Recap report reveals that central and eastern parts of the U.S. saw extensive damage from large hail, straight-line winds, tornadoes and isolated flash flooding during last month’s storms. The most prolific event? A May 8 major storm in the greater Denver, Colorado metro region, where damage from softball-sized hail resulted in an insured loss of more than $1.4 billion in the state alone. Check out I.I.I. facts and statistics on hail here. The National Weather Service has detailed information on severe storm events, including hail, tornadoes and wind. 2016 data on the number of hail events are posted online. Total aggregated economic losses from U.S. severe weather in May were in excess of $4 billion, Aon Benfield said. Damage to vineyards following several years of severe hailstorms in the famed wine-growing region of Burgundy, France, is prompting greater prevention efforts. London’s Daily Telegraph reports that producers are protecting their entire grape harvest with a cloud-seeding system—a hi-tech hail shield that is designed to modify storm clouds and suppress hail formation. The system works by releasing tiny particles of silver iodide into the clouds where they stop the formation of hail stones, thereby reducing the risk of damage. Cloud-seeding, or weather modification, has been used for many years in parts of the United States and Canada not just to suppress hail, but to enhance rainfall and snowfall in some cases. Insurers are involved in the research. This makes sense. According to the National Oceanic Atmospheric Administration, hail causes approximately $1 billion in damage to crops and property annually. A monster hailstorm that pounded Colorado’s Front Range on May 8 is on pace to be Colorado’s most expensive insured catastrophe, with an estimated preliminary insured loss of $1.4 billion, according to the Rocky Mountain Insurance Information Association. For auto, home and business owners living in hail-prone areas, taking steps to minimize hail damage to property is essential. The Insurance Institute for Business and Home Safety (IBHS), is continuing a major multi-year research study into hailstorms. IBHS resources on preventing property losses are available here. Hail claims are making headlines following multiple springtime hailstorms in Texas, including one in the San Antonio region that is expected to be the largest hailstorm in Texas history. While the estimated insured losses from the storms—$1.3 billion and climbing from two storms that hit the Dallas-Fort Worth region in March; as yet not estimated (but expected to be worse) insured losses from a third storm in the Dallas-Fort Worth region April 11; plus a further $1.36 billion early estimate of insured losses from the San Antonio storm April 12—may seem high, property insurers are well-prepared to handle such events. In a new briefing, ratings agency A.M. Best says it expects limited rating actions to result as affected property/casualty insurers are expected to maintain sufficient overall risk-adjusted capitalization relative to their existing financial strength ratings. Which insurers will be most affected? A.M. Best explains that for property insurers, in particular in property lines of business, losses are expected to stem from broken windows and roof damage. This will have an impact on underwriting performance and overall earnings. Companies with a heavy concentration of automobile physical damage will also have significant losses. However, for property insurers the increased use of actual cash value (ACV) for roof repairs, increased deductibles, and improved risk management strategies will help limit the amount of the ultimate claim payment, A.M. Best explains. The impact on most auto physical damage insurers is also expected to be mitigated given the generally large economies of scale of major writers in the market, A.M. Best adds. So, while the Texas hailstorm damage is poised to exceed the nine-year average of $1.2 billion for the United States, most insurers are well-capitalized and able to handle these severe weather events. Check out this review of research and testing related to hail damage by the Insurance Institute for Business & Home Safety. 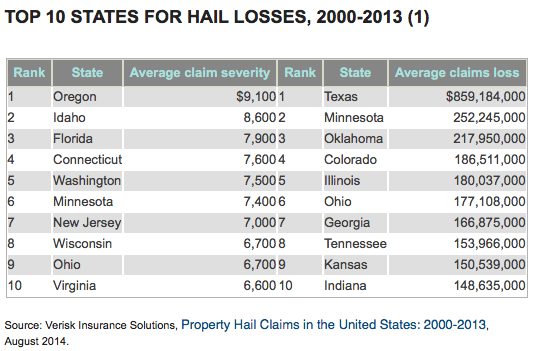 The Insurance Information Institute also has some handy statistics on hail here. A reminder of the impact of severe thunderstorms is evident in March catastrophe estimates, with seven separate events across the country resulting in several billion dollars of insured losses. Aon Benfield’s March Global Catastrophe Recap noted that overall economic losses sustained to property, infrastructure and agriculture across the U.S. from the convective storm and flood damage were anticipated to approach $3.5 billion. More than 1,000 individual reports of tornadoes, damaging straight-line winds and hail were recorded by the Storm Prediction Centre, while torrential rains also led to significant riverine and flash flooding in the Lower Mississippi River Valley. Among the hardest-hit states was Texas, Aon Benfield said, where events during consecutive weeks of greater than golf ball-sized hail in the greater Dallas-Fort Worth metro region led to more than 125,000 home and auto claim filings. The Insurance Council of Texas has put preliminary estimated insured losses in the state at more than $1.1 billion alone. Artemis blog mentions that Impact Forecasting estimates for insured or reinsured losses in the U.S. in the first-quarter of 2016 from severe and winter weather now total $4.48 billion. In its must-read facts and statistics on hail, the Insurance Information Institute notes that events involving wind, hail or flood accounted for $21.4 billion in insured catastrophe losses in 2014 dollars from 1994 to 2014 (not including payouts from the National Flood Insurance Program), according to Verisk’s Property Claim Services. Information about how to reduce hail damage to businesses and homes is available from the Insurance Institute for Business and Home Safety website here and here. A report from the National Insurance Crime Bureau (NICB) has revealed that insurance claims resulting from hailstorm damage in the United States increased by a whopping 84 percent from 2010 to 2012. 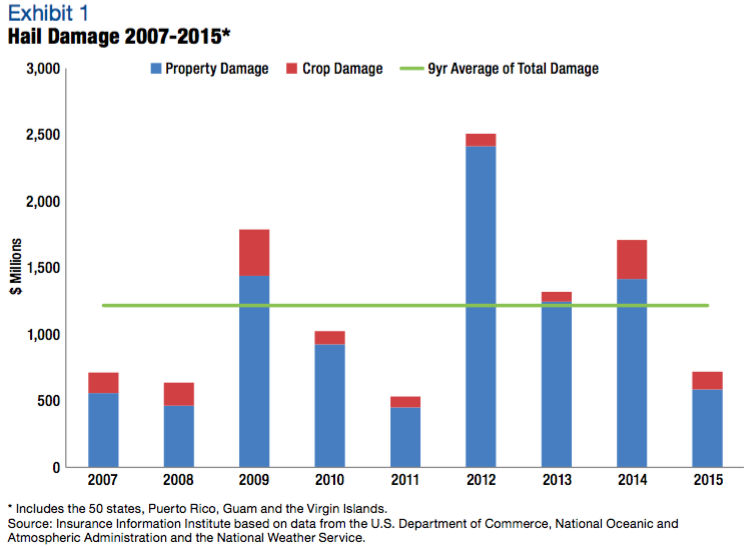 In 2010, there were 467,602 hail damage claims filed, but by 2012 that number hadÃ‚ jumpedÃ‚ to 861,597. All told, over two million hail damage claims were processed from January 1, 2010 to December 31, 2012, the NICB said. 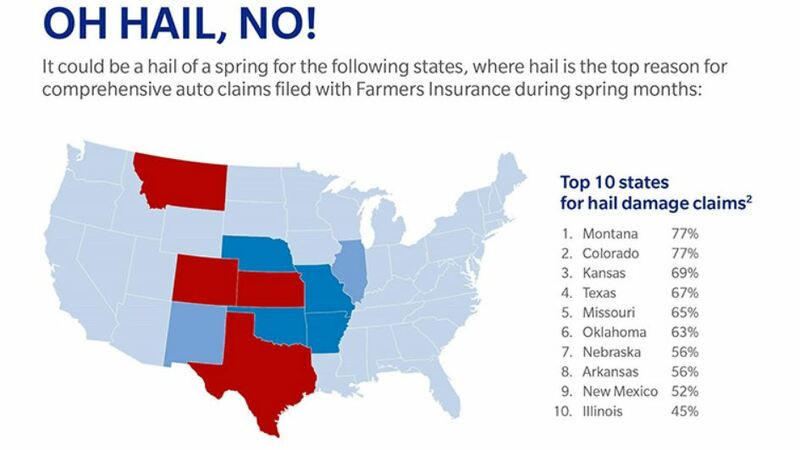 Perhaps not surprisingly the top five states generating hail damage claims during this period were Texas (320,823); Missouri (138,857); Kansas (126,490); Colorado (118,118) and Oklahoma (114,168). Ã¢â‚¬Å“Personal Property HomeownersÃ¢â‚¬  (PPHO) was the policy type most affected by hail loss claims, with 1.3 million, or 64 percent of the total number of hail loss claims between 2010 and 2012. On average, PPHO policies were represented more than twice as often as the next most popular policy type, personal automobile. NICB points out that most of the hail loss claims occurred in the spring and summer months, between March and July, likely due to increased numbers of thunderstorms during this period. While the NICB report focuses just on hail claims, itÃ¢â‚¬â„¢s worth adding that severe thunderstorms in the U.S., including tornadoes, resulted in $14.9 billion in insured losses in 2012, more than $25 billion in insured losses in 2011, and $9.5 billion in insured losses in 2010, according to Munich Re. In the first-half of 2013, insured losses from thunderstorm events exceeded $6 billion, Munich Re said.